The threat reportedly involved a claim that MS-13 wanted to kill NYPD officers who lived in the Brentwood and Central Islip areas as a way of gaining street credibility. 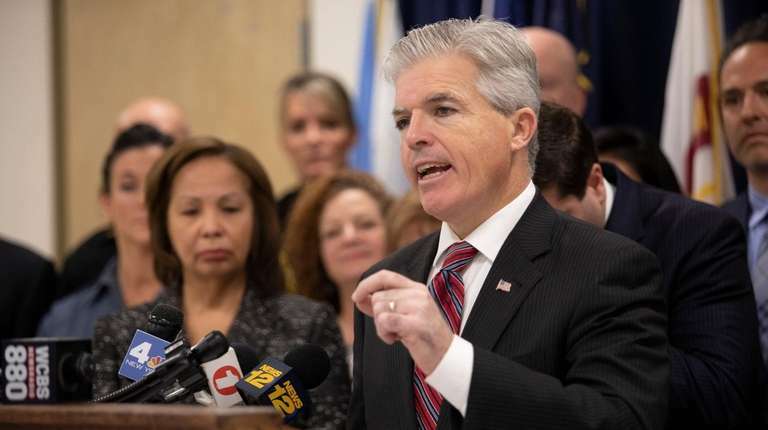 NYPD and Long Island police officials, acting out of a sense of caution, put out alerts to officers after intelligence reports stated that MS-13 gang members were going to target city cops, particularly those living in Suffolk County, for retaliation, officials said. “Out of an abundance of caution an officer safety alert was sent of an unverified threat by MS-13 targeting law enforcement,” the NYPD said in a statement released Wednesday. An NYPD spokesman said the alerts stemmed from a report by state correction officials who learned of a possible threat by the gang to harm cops. A spokeswoman for the state Department of Correctional Services and Community Supervision was unavailable for comment late Wednesday. The threat reportedly involved a claim that MS-13 wanted to kill NYPD officers who lived in the Brentwood and Central Islip areas as a way of gaining street credibility. Gang members were allegedly conducting surveillance of officers’ homes, the reports stated. The threat alerts drew strong reactions from officials in both Nassau and Suffolk counties. Nassau County Police Commissioner Patrick Ryder said he was aware of the threats to cops outside of Nassau County. “Any threat of violence toward any police officer is always taken seriously, thus our officers continue to receive intelligence bulletins advising of any specific threats, safety concerns and are advised to always use due diligence both on and off duty,” Ryder said. Similar threats from MS-13 have percolated through the law enforcement community over the years, officials noted. The gang members, who have been heavily concentrated on Long Island, have spread their activity into New York City where police have targeted them for arrests, particularly in homicide cases. An NYPD official, while not dismissing the latest report, questioned whether a prison inmate might be telling officials about the alleged threat as a way of currying favor or attempting to cooperate in hopes of mitigating a prison sentence. The official said that had the reports emanated from the department’s own street intelligence sources, they might be viewed with more credibility. MS-13 on Long Island: A new and more deadly profileThe recent eruption of gang violence on Long Island -- highlighted by the discovery of the mutilated bodies of four young men in a public park -- fits what experts and sources say is a new and more deadly profile of MS-13.